Enjoy this stylish settee for comfort and sophistication in your living room. Exposed wood feet and the sophisticated shape of the flared arms complement the look of this fantastic loveseat. Two plush down pillows with welt cords add softness to each end of the sofa. Snuggle up on this loveseat to enjoy socializing with friends and family or simply an activity such as watching TV. Available with or without nailhead trim for traditional flair. The Gibson Loveseat Settee by Rowe at AHFA in the area. Product availability may vary. Contact us for the most current availability on this product. Arm Tapered Flared Arms. Fitted Arm Covers available as an optional upgrade. K580 Rockford available with Brass or Pewter Nailheads. Leg or Skirt Carved tapered wood legs. K580 Rockford available with Brass or Pewter Nailheads. Padding & Ergonomics 300CC Cushion Standard. Feather Soft Cushion Package and M850 Cushion Upgrade available. The Gibson collection features a smooth arm and base. 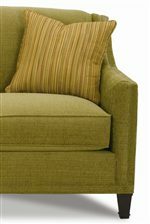 Sophisticated flared tapered arms with a slight wing back, attached back, and plush loose seat cushions. The sofa, settee loveseat, accent chair, and ottoman, provide fantastic possibilities for your home. Furnish your living room with the high-quality and classic style of the Gibson upholstery collection. Available either with or without nail head trim. The Gibson collection is a great option if you are looking for furniture in the area. Browse other items in the Gibson collection from AHFA in the area.